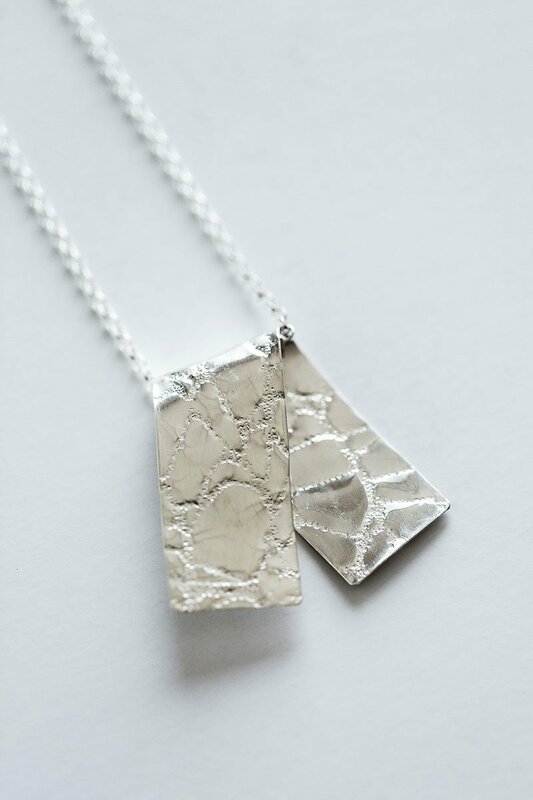 Our range of sterling silver necklaces are lovingly hand made by Jill Alexander in her Wellington studio. Jills work is inspired by the world and people around her, and she enjoys expressing her imagination through her work. If you're looking for the ideal piece of unique jewellery for yourself or as a gift for your loved one, then we're sure you'll find a perfect, eye catching necklace in our collection. Check out our Where to Buy page to find a stockist of any of the pieces below. Looking for a custom made piece of jewellery that's designed and made especially to your wants and requirements? Get in touch and we'll be delighted to work with you to design your dream necklace. The Through the Window Necklace oozes chic style. Hand made in Wellington, New Zealand, from sterling silver, this one-off pendant is hung on an elegant box chain. An ideal gift for a loved one or to add to your own jewellery collection, the Through the Window Necklace is a keeper. Elegant and with texture, the Lightly Touching the Land Necklace is perfect to wear anytime. Hand made in Wellington, New Zealand, this one off design is a beautiful piece to enjoy, day or night. Set on a sterling silver snake chain, the Lightly Touching the Land Necklace adds a touch of sophisticated fun to any outfit and makes a fantastic, special gift for yourself or a loved one. 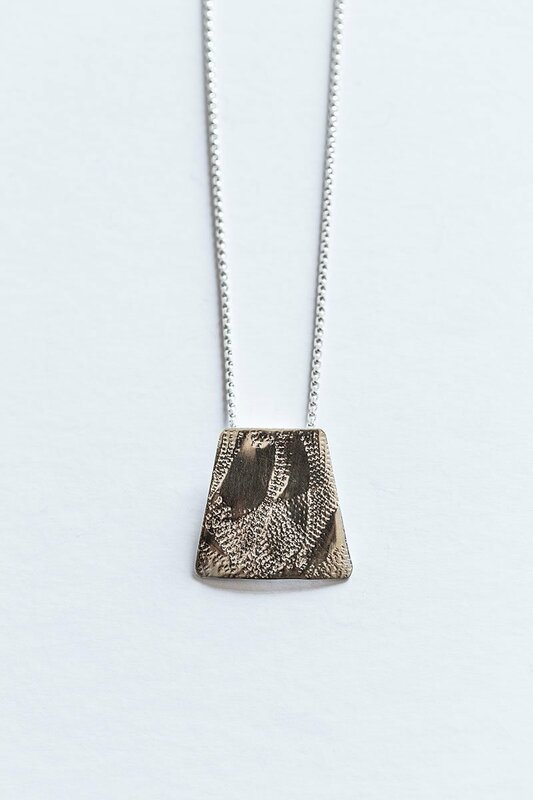 Hung on a belcher chain, the Gently Folded Necklace is made from rolled 925 sterling silver, that is embossed with an unusual and eye catching design and finish. Textured and rolled, it has personality and energy and is beautifully designed. Polished to perfection, the necklace catches the light and adds sparkle to any outfit, day or night. It's curves sit beautifully on its sterling silver chain. Worn on it's own, or accompanied by the matching Gently Folded Earrings, this unique item will turn heads. The Sweet and Stylish Necklace is sure to make a statement wherever you go. Hand crafted in Wellington, New Zealand from the finest 925 sterling silver, this exquisite pendant hangs boldly on a snake chain. Transforming any outfit with its beauty, the Sweet and Stylish necklace has a contemporary design that appeals to all ages. Part of Jill Alexanders Folding Gently collection, this beautiful piece of Kiwi jewellery is sure to impress and will be treasured for years to come. Hand crafted and set on a chunky belcher chain, the Playful People Necklace makes a statement when worn with any outfit, and especially when accompanied by the Playful People Bracelet. Handmade in a picturesque beachfront Wellington studio by contemporary jewellery designer and maker; Jill Alexander, this unusual piece is made from sterling silver. Rolled and hand formed to produce a unique design, this beautiful piece is ideal for any occasion and makes a superb gift. The Just a Touch Necklace is sophisticated and unique. Bringing a touch of shimmer to any time of day, this beautiful piece of hand made New Zealand jewellery is an ideal gift or treasure to keep for yourself. Hung on a sterling silver snake chain, this stylish necklace polishes off any look and adds a touch of glamour. The Deco Detail Necklace looks to the past whilst embracing a sleek and modern design. This stylish piece is hung on a mirror finish box chain that lets the sterling silver pendant do the talking. Set to sparkle in day or candle light, this handmade, unique piece of fine jewellery is truely New Zealand designed and crafted. If you're looking for something to treasure for years to come, then you've found it. The Balbao in Life Necklace is a statement piece that catches the eye and sparks the imagination. Part of Jill Alexanders Free Form Collection, this fun piece is handmade in a picturesque seafront studio in New Zealand, and is a delight to wear. Bold in design and shiny in appearance, this fantastic sterling silver piece of contemporary jewellery makes a fantastic special gift. Drawing inspiration from the world around her, Jill Alexander designed and handmade the Textured Sand Necklace in her waterfront studio in Petone, Wellington, NZ. This beautiful sterling silver piece of jewellery is highly polished to reflect light and catch eyes. Perfect for a night out dancing, a sophisticated meal, or to dress up an understated outfit, the clean, chic look appeals to people of all ages and can be matched with almost any outfit. The Textured Sand Necklace is set on a understated snake chain to allow the silver pendant to do the talking, and looks fabulous worn as a set with the matching earrings. Hand made in Wellington, New Zealand, the Secret Kiss Necklace is crafted from quality sterling silver, and is highly polished to reflect the light with every move. Part of the At Play Collection from Jill, this beautiful necklace has an intriguing pattern that's sure to catch the eye of those around you. Elegant, yet modern in design, the Secret Kiss Necklace is ideal for people of all ages who have an eye for design. Brilliant for dinner or dancing, this beautiful piece is set on a link chain that's comfortable and easy to wear, day or night and looks wonderful alongside the matching Secret Kiss Earrings. Whether you're looking for a new piece of jewellery for yourself, or a present for a loved one for a birthday or special occasion, be sure to consider the beautiful Secret Kiss Necklace.